. "Leonard Braithwaite". The Canadian Encyclopedia, 04 March 2015, Historica Canada. https://www.thecanadianencyclopedia.ca/en/article/leonard-braithwaite. Accessed 20 April 2019. 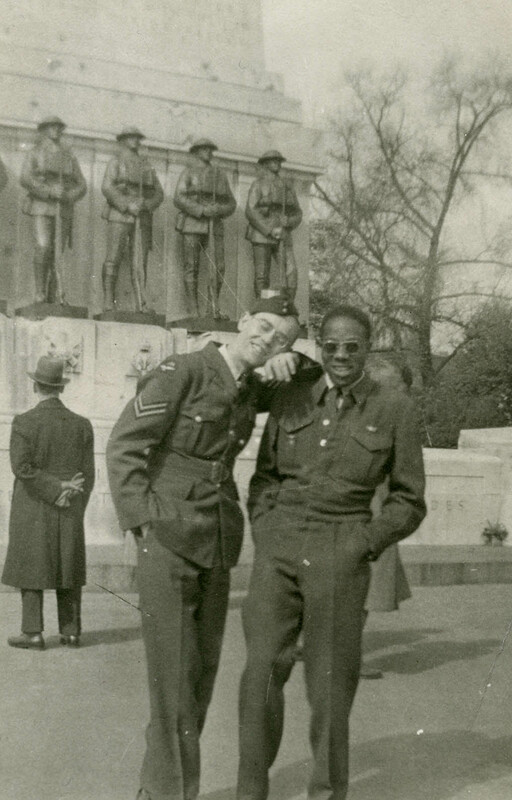 Leonard Braithwaite (right) and his friend Kenneth Moberly after V-E Day in London, England, 1945. Image: Leonard Braithwaite/The Memory Project Archive. 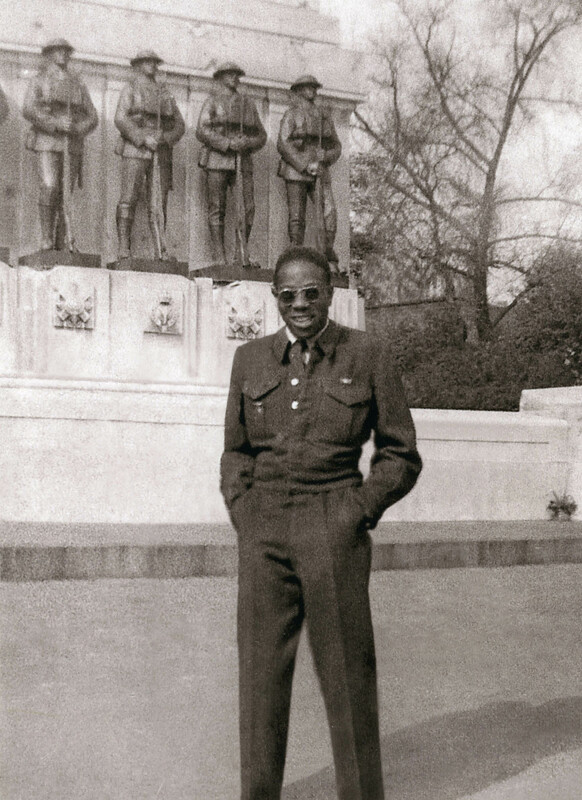 Leonard Braithwaite in uniform in front of the British War Memorial, London, England, just after V-E Day, 1945. Image: Leonard Braithwaite Estate/The Memory Project Archives/Historica Canada. 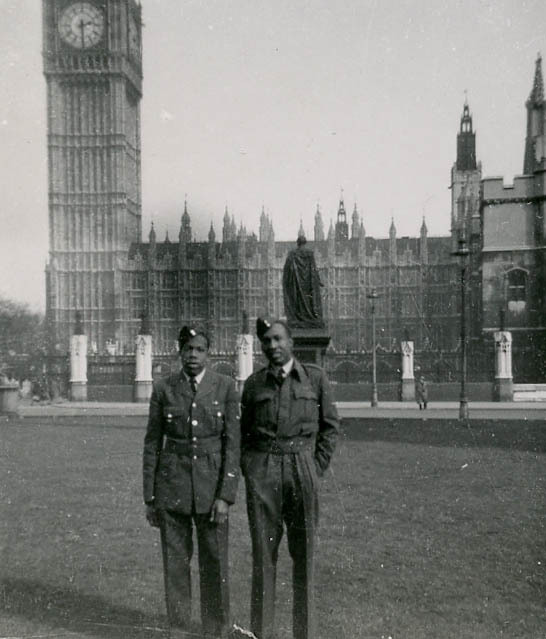 Mr. Braithwaite (left) and a RAF fellow in London, England, Spring 1946. Leonard Braithwaite. Image: Black History Canada/Ontario Black History Society. Leonard Austin Braithwaite, CM, OOnt, QC, lawyer, politician (born 23 October 1923 in Toronto, ON; died 28 March 2012 in Toronto). Braithwaite was the first Black Canadian elected to a provincial legislature. He served as a Liberal member of the Ontario Legislature from 1963 to 1975. Braithwaite was born to a Barbadian father and Jamaican mother in Toronto, Ontario, and raised in the Kensington Market area of the city during the Depression. After several attempts to enlist, and having been turned away in prejudice, Braithwaite joined the Royal Canadian Air Force in 1943. He served with the No. 6 Bomber Command in Yorkshire, England, as an engine mechanic then safety equipment worker. After the war, Braithwaite attended the University of Toronto, where he earned a Bachelor of Commerce degree (1950), followed by a Master in Business Administration from the Harvard Business School (1952). In 1958 he graduated from Osgoode Hall Law School and opened a law practice in Etobicoke, a Toronto suburb. Braithwaite began his political career in 1960 as school trustee for Ward 4 in Etobicoke. Two years later, he was elected as alderman for Ward 4 and sat on the Etobicoke municipal council. Due to his growing popularity in the riding, Braithwaite was approached on separate occasions by members of the Ontario Progressive Conservative party, the NDP and the Liberal party. Each wanted him to join their party and run as a municipal member of parliament (MPP) in the Ontario general election. On 25 September 1963, Braithwaite ran as a Liberal and won, making him the first Black parliamentarian in Canada. On 4 February 1964, in his first speech to the Ontario Legislature, Braithwaite spoke out against the Separate Schools Act, a law that permitted racial segregation in Ontario schools. One month later, education minister and future Ontario Premier Bill Davis introduced a bill that repealed the 114-year-old provision and amended the Act. Braithwaite was re-elected in 1967 and 1971, serving as the Liberal party critic for labour and welfare. As a politician he fought for gender equality and the rights of minorities. In 1971, female students gained the opportunity to work as legislative pages at Queen’s Park, due in part to Braithwaite’s vocal stance on the matter. The position was previously restricted to male students. In 1975, Braithwaite lost his seat in the Ontario Legislature and returned to municipal politics, earning a seat on Etobicoke’s Board of Control. He also returned to his law practice, where he continued to work until his death 28 March 2012 at the age of 88. Braithwaite was appointed Queen's Counsel in 1971. In 1998, he was invested as a Member of the Order of Canada. In 1999, he was elected a bencher of The Law Society of Upper Canada, becoming the first Black bencher in the Society’s 200-year history. He was appointed to the Order of Ontario in 2004. 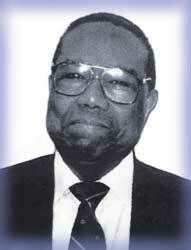 Leonard Braithwaite was a true trailblazerAn obituary for prominent Black Canadian Leonard Braithwaite. Leonard BraithwaiteListen to an interview with Canadian veteran Leonard Braithwaite about his enlistment challenges and subsequent military service during the Second World War. From Historica Canada. Leonard BraithwaiteClick on the link "Read More" for a detailed profile of Leonard Braithwaite, distinguished Ontario lawyer, public servant, and community leader. From the Ontario Black History Society.